Reducing greenhouse gas (GHG) emissions can also improve air quality. We estimate the co-benefits of global GHG mitigation for US air quality in 2050 at fine resolution by downscaling from a previous global study. Foreign GHG mitigation under RCP4.5 contributes more to the US O3 reduction (76 % of the total) than domestic mitigation and contributes 26 % of the PM2.5 reduction. Therefore, the US gains significantly greater air quality co-benefits by coordinating GHG controls internationally. This paper gives first multi-wavelength estimates of SSA and AAE of emissions from combustion of Indonesian peat. In addition, it demonstrates that SSA of biomass burning emissions can be parameterized with EC / (EC+OC) and that this parameterization is quantitatively superior to previously published parameterizations based on MCE. It also shows that EC / (EC+OC) parameterization accurately predicts SSA during the first few hours of aging of a biomass burning plume. Vegetation cover in the remote and cold areas of northern West Siberia is rapidly changing. Analysis of summer maximum vegetation productivity index collected over 15 years (2000–2014) by Terra/Aqua satellites revealed “greening” over the northern (tundra/tundra-forest) and widespread “browning” over the southern (taiga) parts of the region. The vegetation changes around 28 urbanized areas were different. Many Siberian cities become greener even against wider browning trends at the background. We made the first measurements of the concentrations of hydroxyl radical (•OH), a dominant environmental oxidant, in snow grains. Concentrations of •OH in snow at Summit, Greenland, are comparable to values reported for midlatitude cloud and fog drops, even though impurity levels in the snow are much lower. At these concentrations, the lifetimes of organics and bromide in Summit snow are approximately 3 days and 7 h, respectively, suggesting that OH is a major oxidant for both species. In this study, for the first time regional BVOC models are compared with direct regional measurements of fluxes from aircraft, allowing assessment of model accuracy at scales relevant to air quality modeling. We directly assess modeled isoprene emission inventories which are important for regional air quality simulations of ozone and secondary particle concentrations. We examine the chemical composition of fine particulate matter (PM2.5) collected on filters at traditionally undersampled, globally dispersed urban locations. Several PM2.5 chemical components (e.g. ammonium sulfate, ammonium nitrate, and black carbon) vary by more than an order of magnitude between sites while aerosol hygroscopicity varies by a factor of 2. Enhanced anthropogenic dust fractions in large urban areas are apparent from high Zn : Al ratios. Remotely sensed data could provide continuous spatial coverage of aerosol property over the pan-Eurasian area for PEEX program. The AATSR data can be used to retrieve aerosol optical depth (AOD). The Aerosol_cci project provides users with three AOD retrieval algorithms for AATSR data. Because China is vast in territory and has great differences in terms of land surfaces, the combination of the AERONET and CARSNET data can validate the Level 2 AOD products from AATSR data more comprehensively. We studied the impact of crop field burning (CFB) on air pollution in North China Plain (NCP) using MODIS observations and the numerical model WRF-CHEM. The CFB plume emitted in southern NCP and went through a long-range transport to northern NCP. The long-range transport and the effect of mountains obviously enhanced the PM2.5 pollution in northern NCP. The prohibition of CFB should be strict not just in or around Beijing, but also on the ulterior crop growth areas of southern NCP. The aerosol time-of-flight mass spectrometer (ATOFMS) provides size resolved information on the chemical composition of single particles with high time resolution. Within SAPUSS (Solving Aerosol Problems by Using Synergistic Strategies), continuous measurements of ambient particles were made simultaneously at two urban locations in the city of Barcelona (Spain). We find that organic nitrogen is a considerable fraction of the single particles detected, especially at the traffic-dominated site. Using airborne data from of Physics of Stratocumulus Top campaign we analysed turbulence at the interface between free troposphere and cloud top. We found turbulence in temperature inversion capping cloud as well as in adjacent cloud top layer very anisotropic. Eddies are elongated horizontally by wind shear and flattened by static stability. These properties of turbulence at the cloud top were overlooked so far, which explains problems with understanding of entrainment at stratocumulus top. We present measurements of aerosols during the transition from wet to dry seasons at a pristine rainforest site in central Amazonia. By excluding pollution episodes, we focus on natural biogenic aerosols. Submicron aerosols are dominated by organic material, similar to previous wet season measurements. Larger particles are dominated by biological material, mostly fungal spores, with higher concentrations at night. This study provides important data on the nature of particles above the Amazon. The Bardarbunga volcanic fissure during the second half of 2014 caused large amounts of SO2 emission. The paper studies the effects of this increase in pollution levels over Europe during the first 3 months of the eruption with a dispersion model. The model results are compared to satellite and surface concentration observations. The biggest differences are found in Iceland and on the coast of northern Norway. For the average pollution levels over Europe, Iceland is located too far away. In this manuscript, we present a novel, first-principles method for the determination of surface tension of collected liquid aerosol particles. The method uses an atomic force microscope with a specially designed probe to directly measure the surface tension, a physical parameter required for Kohler theory. The measurements were verified using a standard, check-standard and then applied to a dry and humidified oxidized α-pinene aerosol system. Three 30-year simulations of past atmospheric composition changes were performed using different anthropogenic emissions of pollutants accounting or not for the applied air quality legislation and accounting for the year–to–year observed climate and natural emissions variability. The actual benefit of applied legislation along with technological advances is higher than what is usually calculated by a simple comparison of today's atmosphere against a constant anthropogenic emissions simulation. Computer models are our primary tool to investigate how fossil-fuel emissions are affecting the climate. Here, we used three different climate models to see how they simulate the response to removing sulfur dioxide emissions from China. We found that the models disagreed substantially on how large the climate effect is from the emissions in this region. This range of outcomes is concerning if scientists or policy makers have to rely on any one model when performing their own studies. New reaction pathways of highly oxidized multifunctional organic compounds (HOMs) from the ozonolysis of the sesquiterpene (C15H24) beta-caryophyllene were elucidated based on experiments using isotopically labelled ozone and H/D exchange experiments. These new insights in reaction pathways of unsaturated RO2 radicals are responsible for the production of about two-thirds of the detected HOMs from beta-caryophyllene and extend the knowledge of HOM formation mechanisms in the atmosphere. The chemical budgets and principal sources of ROx and NO3 radicals during a multi-day photochemical smog episode in Hong Kong are elucidated by an observation-constrained MCM model. NO3 was shown to be an important oxidant even during daytime in a pollution case when high aerosol loading attenuated the solar irradiation. This study suggests the potential important role of daytime NO3 chemistry in polluted atmospheres under conditions with the co-existence of abundant O3, NO2, VOCs, and aerosols. Atmospheric sea salt particles provide surface area for the condensation of gaseous substances and, thus, impact these substances' atmospheric residence time and chemical reactions. The number and size of sea salt particles govern the strength of these impacts. Therefore, these parameters should be reflected accurately in chemistry transport models. In this study, three different sea salt emission functions are compared in order to evaluate which one is best suited for the given model setup. Two CO2 time series measured at the High Alpine Research Station Jungfraujoch, Switzerland (3580 m a.s.l. ), in the period from 2005 to 2013 were compared. One data set was measured in situ whereas the other data set was measured in the column above Jungfraujoch. The trends of the column integrated and the in situ data set are in good agreement, the amplitude of the in situ data set is ca. two times the amplitude of the column integrated data set, because it is closer to the sources and sinks. The PBL height retrieval from CALIOP aboard CALIPSO can significantly complement the traditional ground-based methods, which is only for one site. Our study, to our current knowledge, is the first intercomparison study of PBLH on a large scale using long-term radiosonde observations in China. Three matchup schemes were proposed based on the position of radiosondes relative to CALIPSO ground tracks in China. Results indicate that CALIOP is promising for reliable PBLH retrievals. For highly populated cities in eastern Asian, traffic management has played an increasingly important role in mitigating local emissions from vehicles. Therefore, high-resolution vehicle emission inventory is an irreplaceable assessment tool. This study selected Macau, the most populated city in the world, to demonstrate a high-resolution simulation of vehicular pollution by coupling detailed local data collected and interdisciplinary models. Sudden stratospheric warmings (SSWs) influence the atmospheric circulation over a large range of altitudes and latitudes. We investigate the global distribution of small-scale gravity waves (GWs) during SSWs as derived from 13 years of satellite observations. We find that GWs may play an important role for triggering SSWs by preconditioning the polar vortex, as well as during long-lasting vortex recovery phases after SSWs. The GW distribution during SSWs displays strong day-to-day variability. The impact of changes in incoming solar radiation on stratospheric ozone has important impacts on the atmosphere. Understanding this ozone response is crucial for constraining how solar activity affects climate. This study analyses the solar ozone response (SOR) in satellite datasets and shows that there are substantial differences in the magnitude and spatial structure across different records. In particular, the SOR in the new SAGE v7.0 mixing ratio data is smaller than in the previous v6.2. The springtime organic aerosol (OA) concentrations in the Guanzhong Basin, China are simulated using the WRF-Chem model with two secondary OA (SOA) modules. Model results are verified with near-surface observations. The non-traditional SOA module significantly improves SOA simulation. Oxidation and partitioning of primary OAs is the most important pathway in SOA formation. Residential emissions are the dominant anthropogenic OA source. We conducted a comprehensive modelling work to understand the impact of biomass burning on synoptic weather during agricultural burning season in East China. We demonstrated that the numerical model with fire emission, chemical processes, and aerosol–meteorology online coupled could reproduce the change of air temperature and precipitation induced by air pollution during this event. This study highlights the importance of including human activities in numerical-model-based weather forecast. In the Hadley cells, air rises at the Equator and sinks over the subtropics, drying the air and creating deserts on land. We investigated simple climate model experiments and found that the Hadley cells expand in response to increasing carbon dioxide. The climate of some models warms more than others, and these models also have greater Hadley cell expansion. This expansion could shift deserts toward more populated areas, with potentially major impacts on water resources and surface climate. The periodic emissions from farmers' activities in the NCP were found to make a great contribution to atmospheric WSIs in Beijing: crop straw burning contributed to K+ in Beijing; coal combustion for heating by farmers in winter and the use of NH4Cl fertilizers in the NCP contributed to Cl− in Beijing. The harvest and soil ploughing in autumn contributed to the regional Ca2+. In addition, the mineral dust greatly accelerated formation of sulfate and nitrate through heterogeneous reactions. The current El Niño event has had a dramatic impact on the amount of Indonesian biomass burning and subsequent greenhouse gas emission. We have used satellite observations of CH4 and CO2 of these fires to probe aspects of their chemical composition. We show large enhancements in the amount of these species, due to the fire emissions. The ability to determine large-scale emission ratios from space allows the combustion behaviour of very large regions of burning to be characterised and understood. Relying on a 9-year record of satellite observations of formaldehyde, we use inverse techniques to derive global top–down hydrocarbon fluxes over 2005–2013, infer seasonal and interannual variability, and detect emission trends. Our results suggest changes in fire seasonal patterns, a stronger contribution of agricultural burning, overestimated isoprene flux rates in the tropics, overly decreased isoprene emissions due to soil moisture stress in arid areas, and enhanced isoprene trends. This study provides statistics of the vertical air motion characteristics in convective clouds using aircraft in situ measurements from three field campaigns. Small-scale drafts are frequently observed and make important contributions to total air mass flux. The probability density functions and profiles of the observed vertical velocity and air mass flux are provided. The differences among the three field campaigns are compared. Factors influencing the vertical air motions are discussed. In this study, we focused on the contributions of soil biogenic NO and HONO emissions from a managed hyperarid ecosystem to the regional NOx emissions during growing season. In particular, the second maximum in summer provides substantial evidence to hypothesize that those biogenic emissions from soils of managed drylands in the growing period may be much more important contributors to regional NOx budgets of dryland regions than previously thought. We investigate the aging of air in the stratosphere caused by transport due to Brewer's circulation, using the Boundary Impulse Evolving Response (BIER) method. The age spectra show multiple peaks caused by the seasonal and inter-annual variations of transport. The modal age is controlled by the residual circulation in the tropics and winter hemisphere extratropics and by mixing in the summer hemisphere. Analysis of the full age spectrum is strongly recommended for model inter-comparisons. This study was performed to identify likely source directions and locations of total gaseous mercury (TGM) using CPF, CBPF and TPSCF. Previous studies showed the importance of long-range transport of TGM but not local sources. However, the results from various approaches suggested the importance of local sources near industrial areas including iron and manufacturing facilities, hazardous waste incinerators and the coastal areas relative to distant sources. We developed and tested a strategy for combining TES and IASI free-tropospheric ozone data. A time series of the merged ozone data is presented for regional monthly means over the western US, Europe, and eastern Asia. 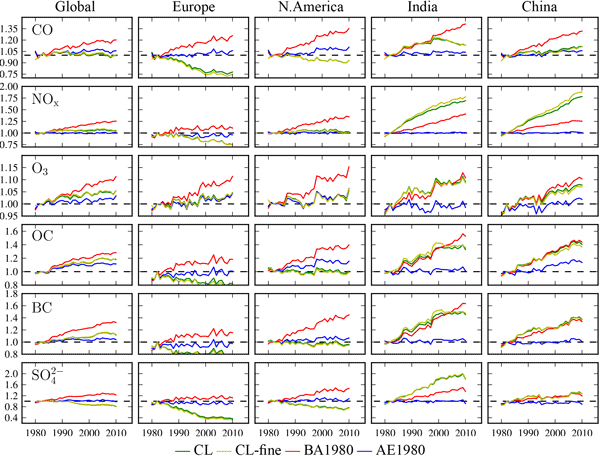 We show that free-tropospheric ozone over Europe and the western US has remained relatively constant over the past decade but that, contrary to expectations, ozone over Asia in recent years does not continue the rapid rate of increase observed from 2004–2010. Atmospheric salt deposition in a tropical mountain rainforest at the eastern Andean slopes of south Ecuador – Pacific or Atlantic origin? We have analysed the atmospheric deposition of sodium and chloride and its emission sources in a tropical mountain forest characterized by a very complex terrain in the south of Ecuador. We found that, given the special location of the study area in a topographic depression in the Andes and thanks to the seasonal shifts in the atmospheric synoptic circulation, the contribution of additional sea salt sources might in part alleviate the scarcity of salt seen in other forests in the western Amazon. An high-resolution time-of-flight aerosol mass spectrometer, together with other relevant instruments, was deployed at two of China's national background sites in northern and southern China in the spring season, in order to characterize submicron aerosol composition and sources. The findings indicated that possible sources might not only include emissions from the Chinese mainland but also include emissions from ocean-going cargo ships and biomass burning in neighboring countries. Indoor and outdoor formaldehyde (HCHO) are both of considerable concern because of its health effects and its role in atmospheric chemistry. The heterogeneous reactions between gaseous HCHO with soils can pose important impact on both HCHO budget and soil ecosystem. Our results confirms that HCHO uptake by soil is a complex process involving both adsorption/desorption and chemical reactions. Soil and soil-derived airborne particles can either act as a source or a sink for HCHO.